Former President George W. Bush said Wednesday he has no regrets about authorizing the controversial waterboarding technique to interrogate terrorist suspects. (CNN) - In some of his most candid comments since leaving the White House, former President George W. Bush said Wednesday he has no regrets about authorizing the controversial waterboarding technique to interrogate terrorist suspects and wouldn't hesitate to do so again. "Yeah, we waterboarded Khalid Sheikh Mohammed," the former president said during an appearance at the Economic Club of Grand Rapids, Michigan, according to the Grand Rapids Press. "I'd do it again to save lives," he added. In a question-and-answer session following his speech to the group of local business leaders, the former president also defended his 2003 decision to invade Iraq. "Getting rid of Saddam Hussein was the right thing to do and the world is a better place without him," he said according to the paper. Bush's comments come days after a CNN/Opinion Research Corporation survey showed 64 percent of American's favor President Barack Obama's plan to significantly draw down troop levels in Iraq by the end of the summer. But public approval of the plan falls to 51 percent if Iraq does not have a stable government by August, the poll also showed. The former president also opened up on a host of other issues, including the role faith played during his years in the White House. "I prayed a lot," he said. "I really did. I prayed before every major speech. I prayed before debates. It was a very important experience." "I don't see how you can be president and not believe in a higher power," he added. 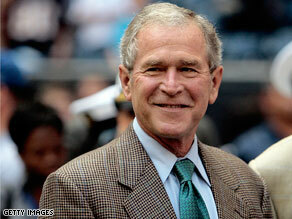 Bush's recently completed memoir, titled "Decision Points," will hit bookshelves next November. When didn't Bush's comments raise eyebrows! Oh, and would Jesus torture or agree with torture? Of course not. Yet here is supposedly God-fearing Bush in support of such an unbiblical practice. Pathetic and hypocritical, this.